The New Horizons Band Dallas(NHBD) is a volunteer, nonprofit, 501(c)(3) association. NHBD provides the opportunity for people ages 50+ who play, used to play, or want to learn to play a wind or percussion instrument. The NHBD association currently has four bands and one ensemble. The primary or main group is the New Horizons Concert Band, with over 65 active members and growing. The other three bands are the UpSwing Jazz Orchestra, the DixieSwing Dixieland Band, and JazzLand. The association's ensemble is the Dallas Low Brass Choir. All five groups play for a variety of events in the Greater Dallas area. More information about each group is provided below. The Concert Band, under the direction of Mr. Lorenzo Parker, plays traditional band music, e.g., marches, patriotic tunes, collections from Broadway musicals, love songs, popular music and contemporary children's songs for children's groups. The 20-member UpSwing Jazz Orchestra, under the direction of Mr. Bill Geyer, performs for senior centers, retirement facilities, schools, and events such as meetings and receptions. The group plays Big Band swing, jazz and Latin music of the 30s and 40s, plus a little rock from the 50s and 60s. The 8-member DixieSwing Band also performs for senior centers, retirement facilities, schools, and private events. This group plays, yes you guessed it, New Orleans-style Dixieland music. Click HERE to see names of DixieSwing members. 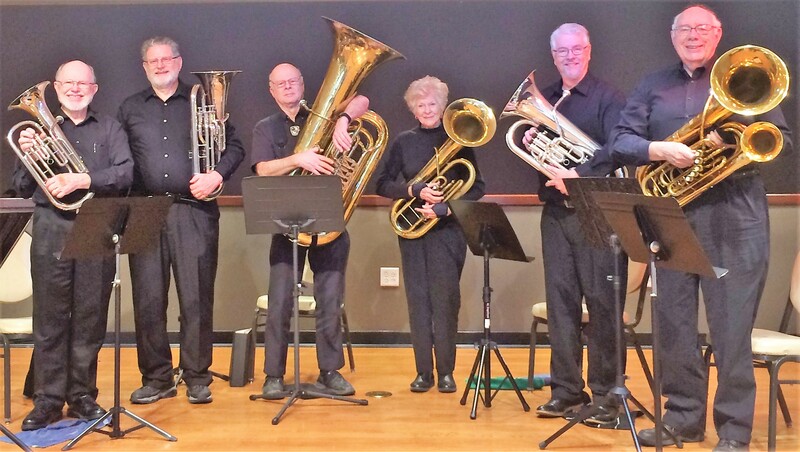 The Dallas Low Brass Choir is composed of 1 tuba, 4 baritones, and 4 euphoniums. Originally these musicians were simply members of the New Horizons Concert Band of Dallas, but as time passed, they became aware of the unique sound they create within the NHBD brass section. They decided their particular instruments create a certain tonal quality not often heard as a group. Dallas Low Brass Choir loves to play for groups who can fully appreciate the unique music they create. Their programs range from 30 minutes to an hour with performances concentrating on Church, Christmas, Thanksgiving and Irish programs. The group has put together Patriotic and American Regional programs and is open to creating music programs as requested. Our newest group of seven musicians plays light improvisational jazz music, of many great standard charts. Click HERE for additional information about the JazzLand group. Copyright © 2009 New Horizons Band Dallas Association. All rights reserved.